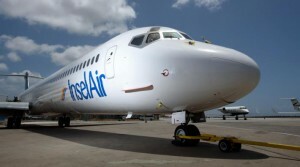 WILLEMSTAD - Today the defective aircraft from the local airline InselAir is being repaired. But at the same time, the second Fokker 50 is grounded for part of the day because of an inspection. Financial director André Delger expects 'a difficult day'. The Curaçao airline tries to respond as much as possible to the situation and compensates for the lack of aircraft due to changes in the flight schedule. Paramaribo is currently being flown with an Airbus A320 from the Haitian company Sunrise.